The expression on your face lets the world know what kind of mood you’re in. We call this project “Moods.” It just fascinates me to see how enthused the kids are with this art venture. They are so expressive and so willing to show it. 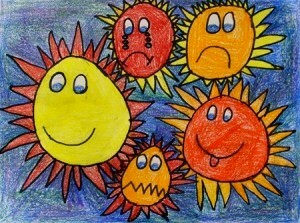 The supply list and directions for this project, “Moods” is in the 2nd Grade Projects Gallery in the sidebar. This entry was posted in 2nd Grade and tagged 2nd Grade, art and crafts for kids, classroom art for kids, facial expressions, for kids, moods, project, sun faces, sun faces art for kids. Bookmark the permalink.